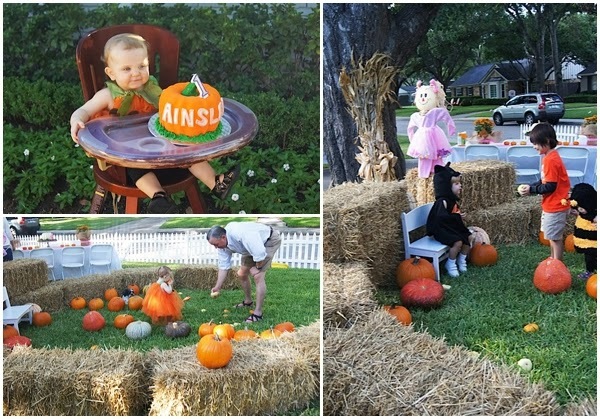 A Sweet Pumpkin Patch 1st Birthday! Whether you're spending the night trick-or-treating with your kids, or spending the evening out on the town--we want to wish everyone a very Happy Halloween!! 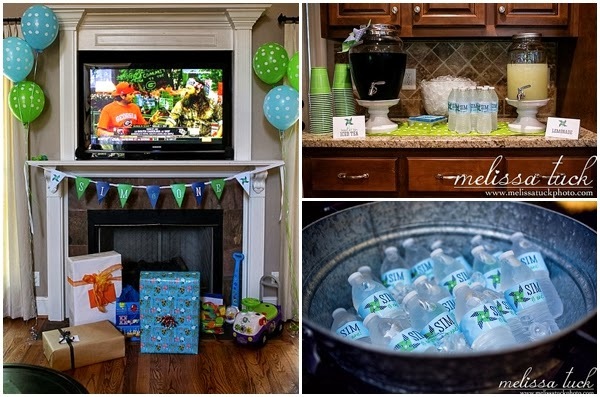 To celebrate this spooky holiday, we're sharing the cutest Halloween birthday bash. 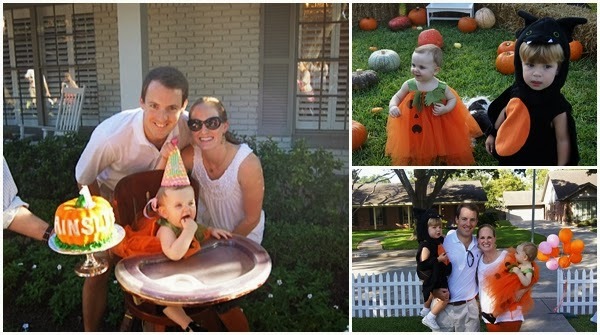 Since Ainslee is the sweetest pumpkin in the patch, her parents threw her a first birthday full of Halloween fun!! 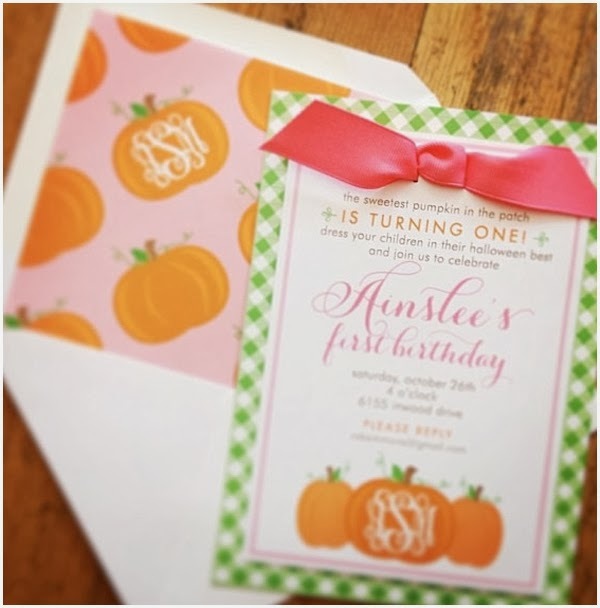 To keep Ainslee's party sweet, while still getting guests in the Halloween spirit, we incorporated unexpected accents into her invitation including green gingham, a monogrammed pumpkin, and of course...a bright pink bow! 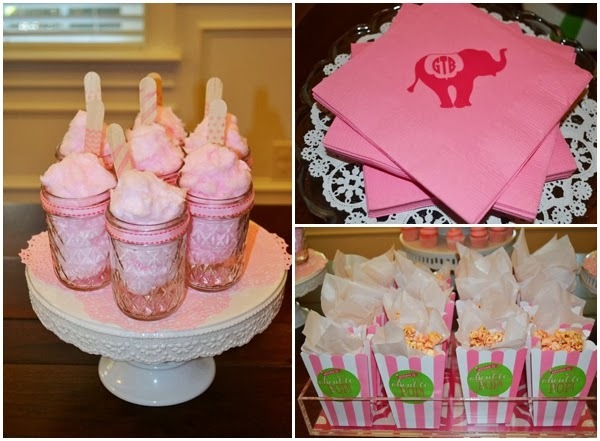 Ainslee's invitations were full of treats (no tricks involved! ), and were finished with a precious pumpkin envelope liner...so adorable! 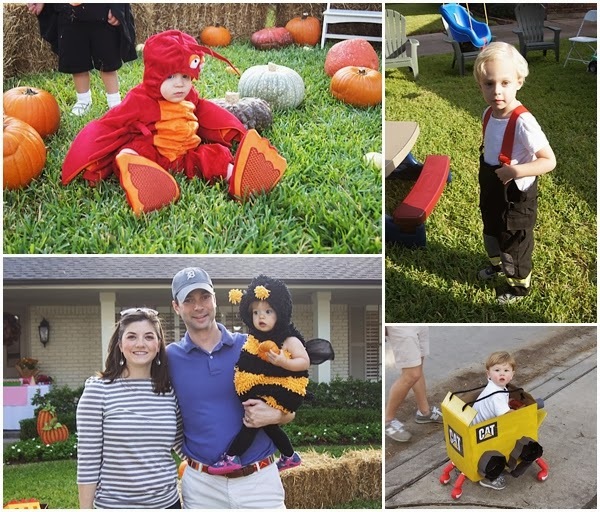 Ainslee's guests came dressed to impress--all showing off their fabulous costumes! 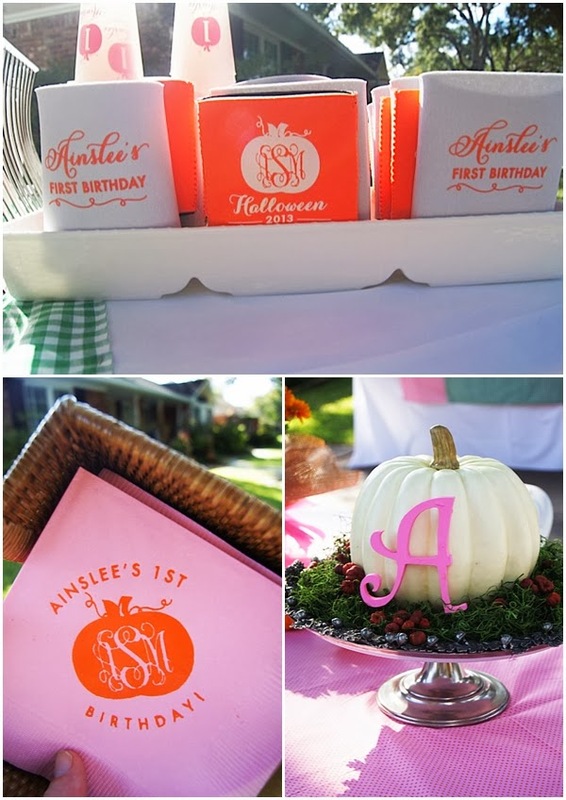 To carry the sweet pumpkin theme throughout the event, we designed custom napkins, cups, and water bottle labels! 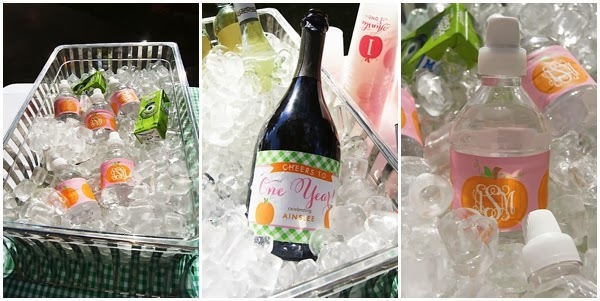 To keep ghouls and goblins (and adult party guests) happy, Ainslee's mom ordered cute koozies and champagne labels--cheers to the birthday girl!! 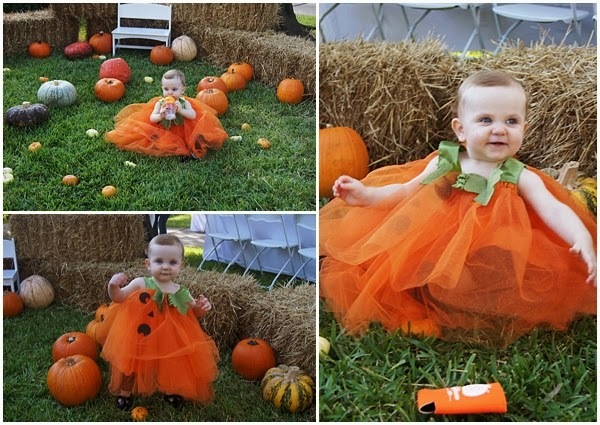 The sweetest pumpkin in the patch, Ainslee!! Happy first birthday to Ainslee, and Happy Halloween to everyone else!! 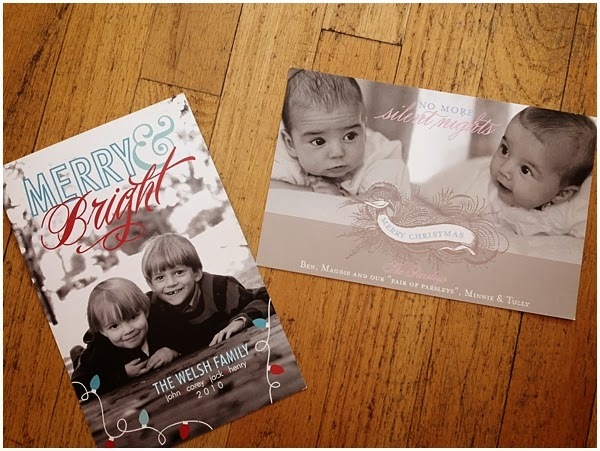 A reminder: there are only 24 hours left to take advantage of our super swanky holiday card deal!! Through tomorrow, take 20% off the printing of your custom card. E-mail info@nicoandlala.com to get started, or visit our website for more details! 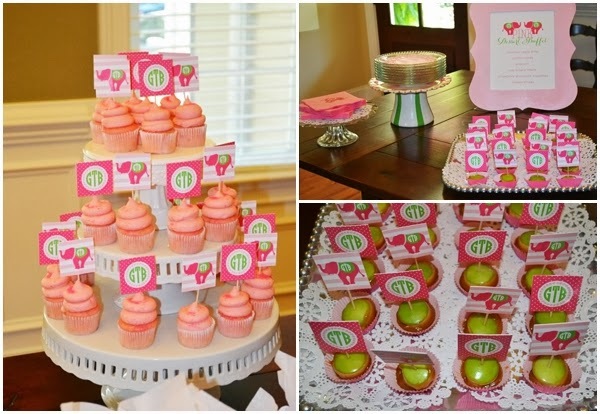 Grab your pink and pearls, we've got a swanky Lilly Pulitzer inspired baby shower to share!!! 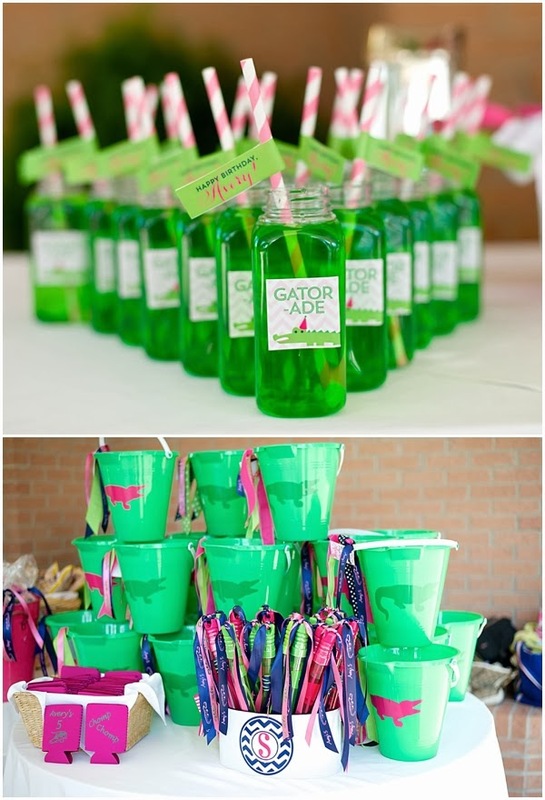 This preppy event was thrown by one of our favorite clients. 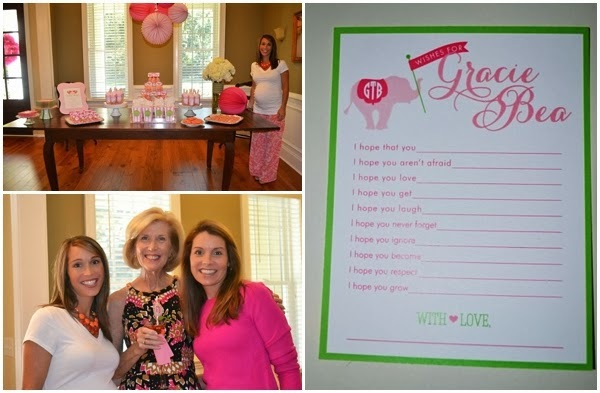 Julie Bea is so creative and fun, we had a blast creating these precious invitations and party swag for the shower honoring mom-to-be, Megan, and baby Gracie Bea! In true Lilly fashion, we started with pink and green...and then added pink, pink, and more pink for this sweet baby girl. The invitation itself was a work of art! Featuring precious elephants (some of them adorned with pearls!) 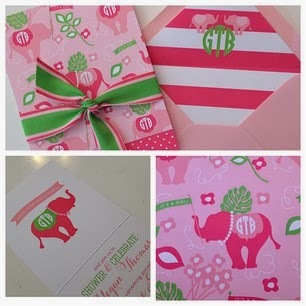 and accented with polka dots and flowers, her invites exuded Lilly goodness!! We tied everything together with a pink and green ribbon, and lined the baby pink envelope with a preppy pink and white striped liner. Amazing...and adorable!!! If you think this invite is good, just wait for the unbelievable party swag to follow, it's every Lilly girl's dream baby shower!! 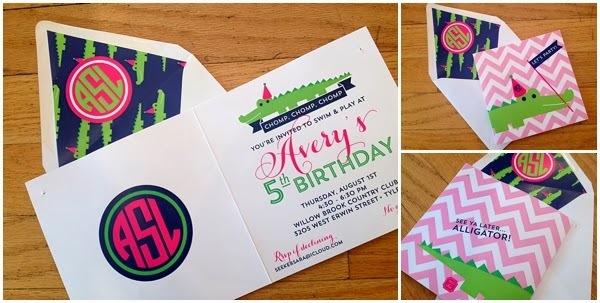 Could these sweet invites get any more preppy and fun?! 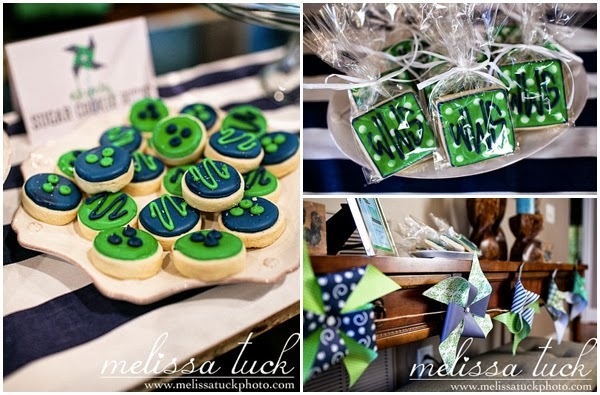 Sweetest monogrammed cookies with custom favor tags...we're obsessed!!! 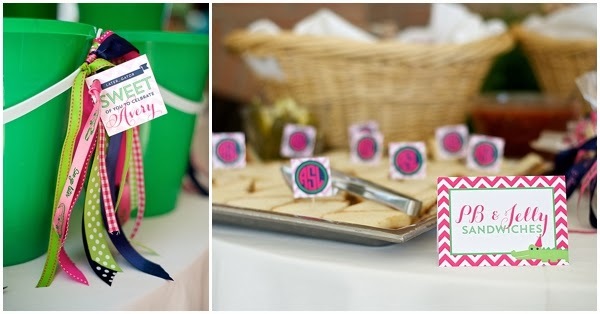 This Lilly-inspired shower wouldn't be complete without some adorable pink and green signs featuring our favorite Lilly Pulitzer quotes! 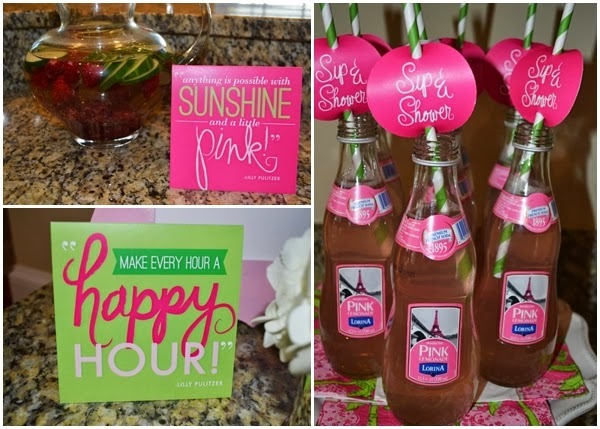 We made this happy hour the happiest with monogrammed straw tags, Lilly Pulitzer quote signs, custom champagne labels, and cocktail napkins. This adorable gift basket is complete with diaper bag tags, personalized notecards, bottle labels, and a "cheers to sweet baby Gracie Bea" champagne label, and is paired with every pink baby item imaginable! 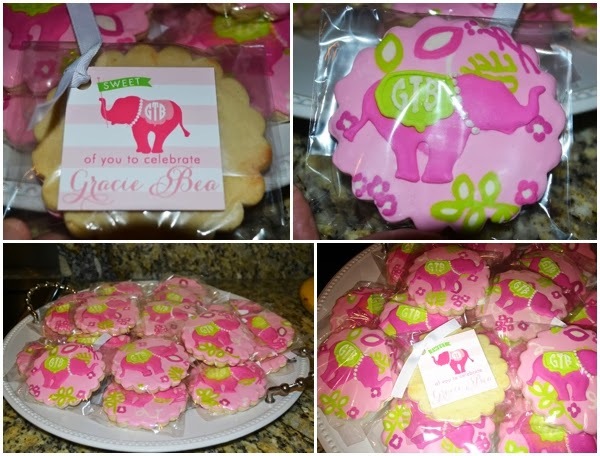 We love all of the fun swag Julie Bea ordered for this shower including "wish cards" for baby Gracie Bea! Such a sweet idea for both mom and baby. 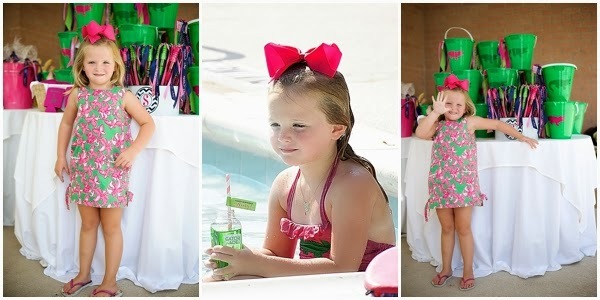 Want to see more Lilly Pulitzer inspired parties we've created? 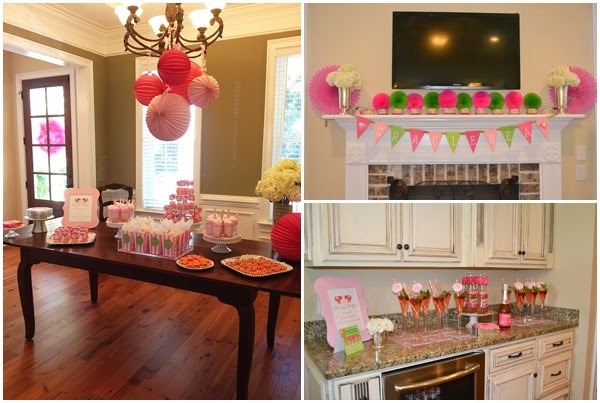 Be sure to check out Lily's pink and green pizzaz party in our children's parties gallery. 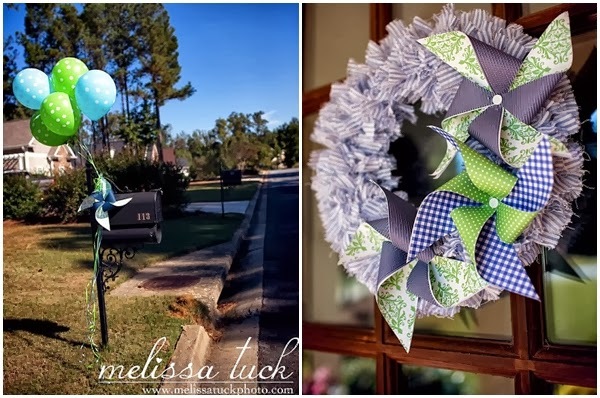 We're spinning with excitement over this first birthday, because it's a pinwheel party!!! For Sim's birthday, his mom came to us with the most creative and fun party theme...pinwheels!! The pinwheels not only added a great decorative element to the event, but they were also such a creative inspiration for the invitation! 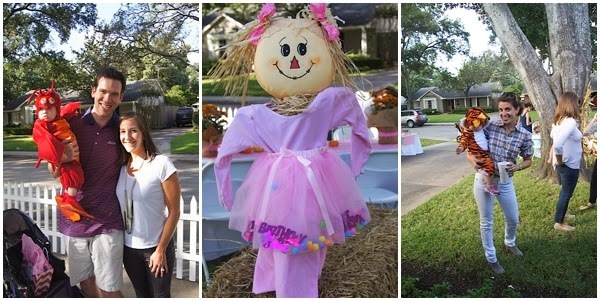 The perfect inspiration to create a whimsical end of summer birthday bash!!! 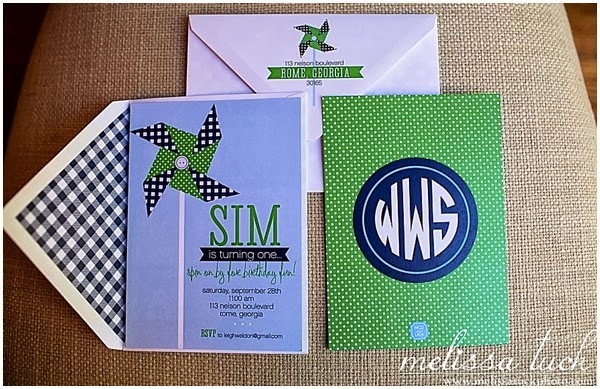 Sim's perfect pinwheel invitations! We stuck with three main design elements to keep the invite clean and fun! We started with baby blue, and pulled the gingham and polka dot patterns from the pinwheels to create a fun invite! And of course, in true Nico and Lala fashion, we included Sim's monogram on the back! 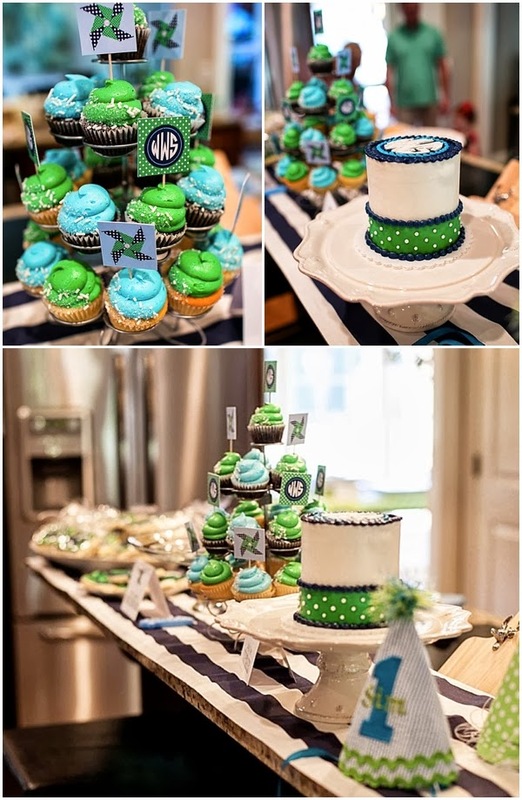 Check out the rest of his party swag below, including the pinwheels that inspired it all!! 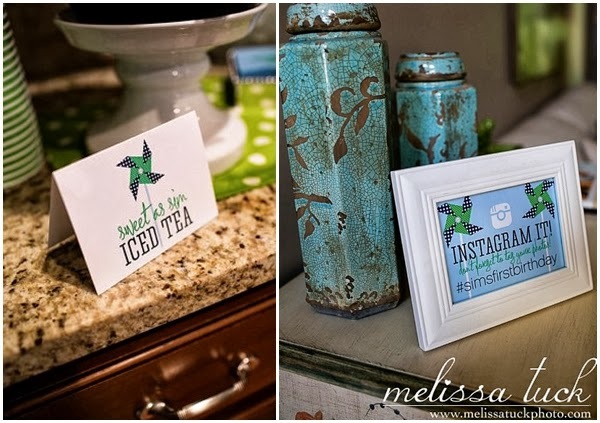 We're huge fans of custom Instagram signs--such a fun way for guests to share their photos! 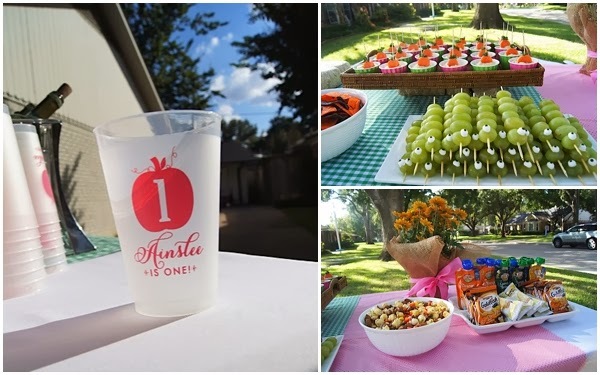 It wouldn't be an N&L party without a custom banner, water bottle labels, and food signs! 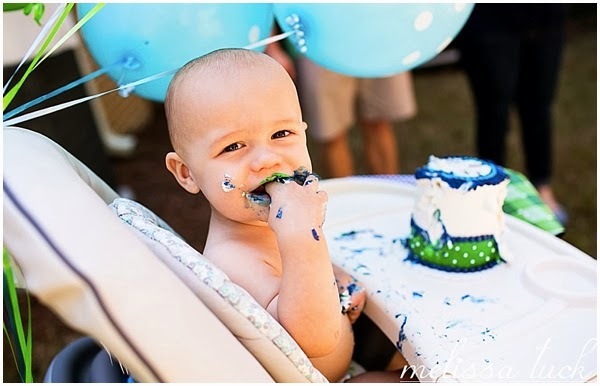 We had to share these smash cake pictures...they're too cute!! We love that the cake matched our invite, and we love the birthday boy who smashed the cake even more!! Happy first birthday, Sim!! 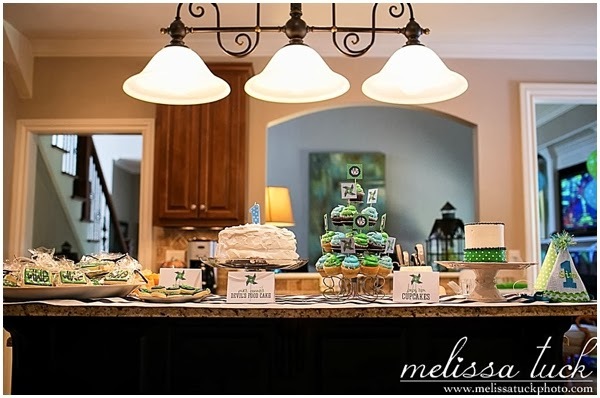 We had so much fun helping make your day special! 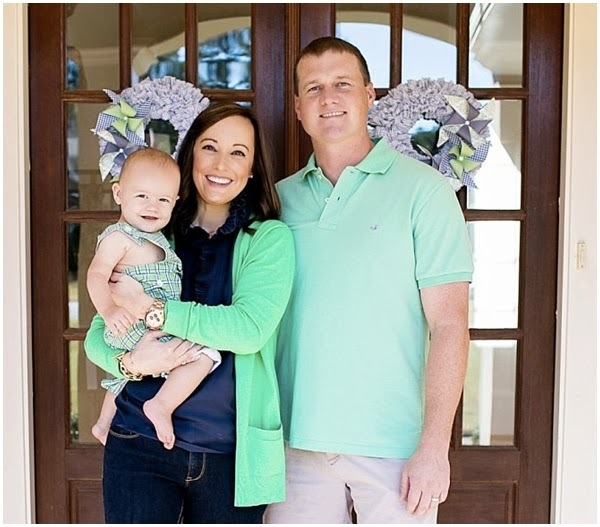 Photo Credit: Big thank you to Melissa Tuck Photography in Arlington, VA for the beautiful pics! It's Wednesday!! Not only are we halfway through the work week, it also means it's...Wedding Wednesday! To celebrate, we want to share one of our favorite printing processes for wedding invitations...foil stamping! 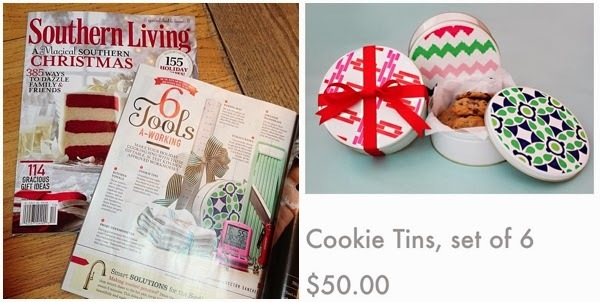 We touched on foil stamping in our recent blog post "Things We Heart: October Edition," but felt this new trend deserved a post to itself! 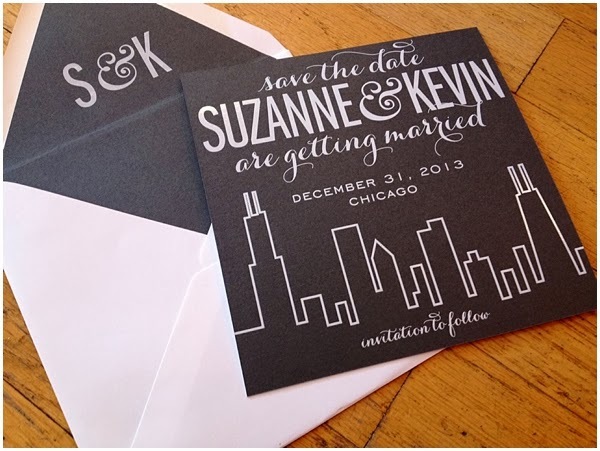 LOVE the Chicago skyline in this white foil stamped save the date! Foil stamping is a great option for brides wanting a true metallic print on her invitations, or for those who are envisioning white text on a colored paper. This printing process truly gives the most authentic metallic text, so with all of our recent requests for gold...we've been turning to foil stamping! 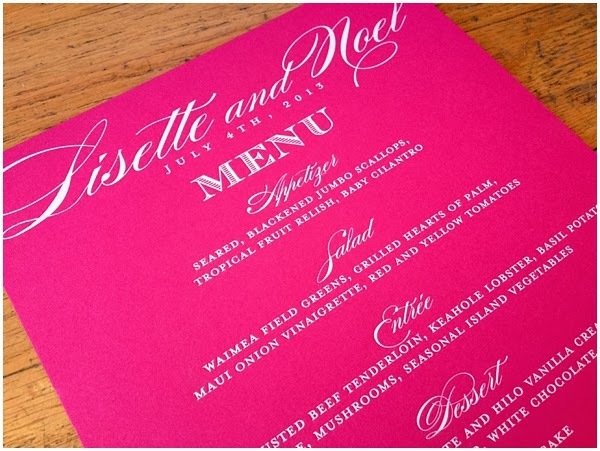 Foil stamping is super swanky on reception items, like these wedding menus! 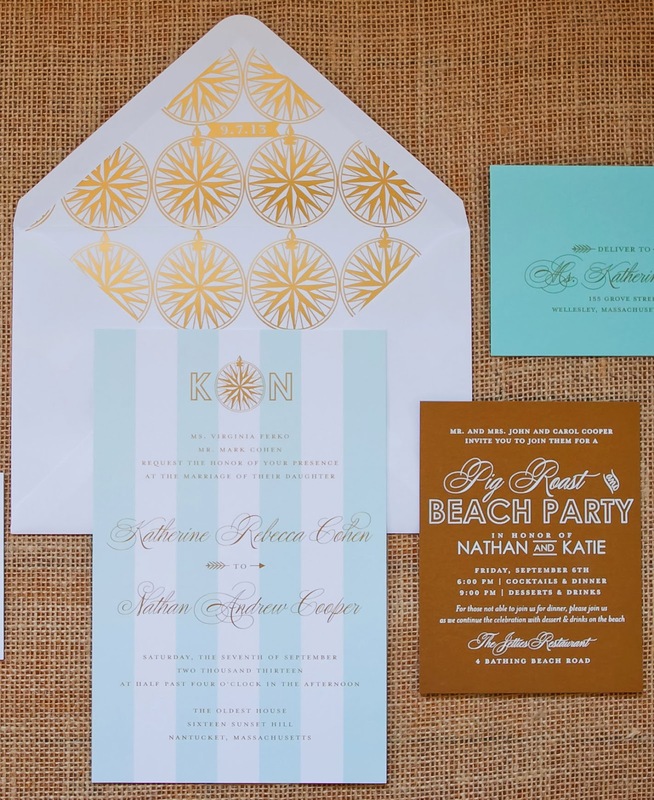 In addition to printing metallic, it is also a great option for brides who want to print white on colored paper. 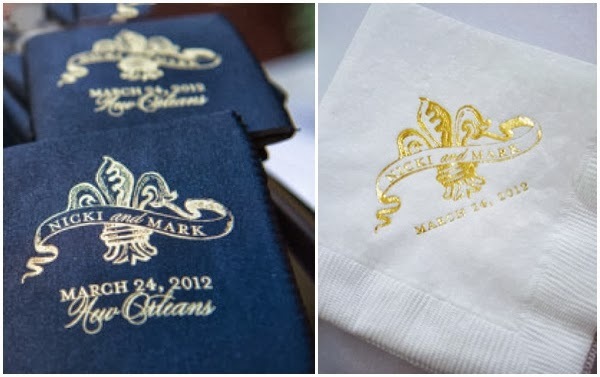 In the printing world, there is no such thing as white ink, so brides who want white text on colored paper have two options: foil stamping or engraving. Don't get us wrong, we are all for engraving, but foil stamping is a considerably less expensive option, and yields a crisp and clean finished product! Foil stamping works well with both classic and modern designs, with the shine of the metallic foil adding a pop of perfection and shine! To see some of the stunning foil stamp work we've done, check out some of our most recent examples below!! Katie came to us wanting something that was tasteful, but not your traditional Nantucket nautical themed wedding invitation. She opted for golds, whites, and a soft turquoisey blue, rather than the navy and green most of our Nantucket brides favor! With several insert cards to include in her ensemble due to a weekend packed full of fabulous events, we decided to do varying colors of foil, on different papers, to compliment the color scheme. The striped invitation was printed first in lithography (which is flat printing) in the blue. Once that was dry, it was then foil stamped over that in gold to add that pop of metallic! So beautiful! With the reply card being printed on coordinating white stock (sans the stripes) then printed with gold foil, we thought it only appropriate to do the "Welcome Party Pig Roast" insert on gold metallic paper, and reverse it out by foil stamping in white! We took this beautiful invitation to another level by adding a coordinating gold foil stamped envelope liner featuring the compass element from their wedding logo...perfection! Katie said literally every guest called or emailed her upon receiving the invitation--and was blown away by their response! She was so overwhelmed with their paper love for the final invitation ensemble! We hit the nail on the head! 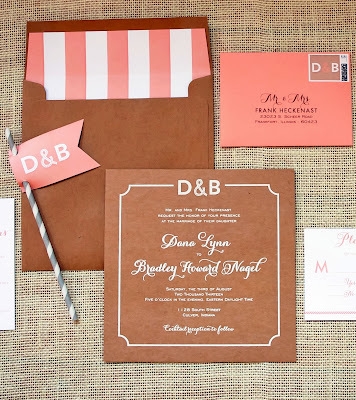 For Dana's invitation, her lakeside wedding called for neutrals with a pop of her favorite summer shade of coral! We decided to do an unexpected shape since it was a more casual affair than your average black-tie country club wedding. With their wedding logo anchoring the text, the square format helped the layout flow beautifully! Dana loved the recycled look of this kraft paper and foil stamping in white, so choosing foil stamping was a no brainer! 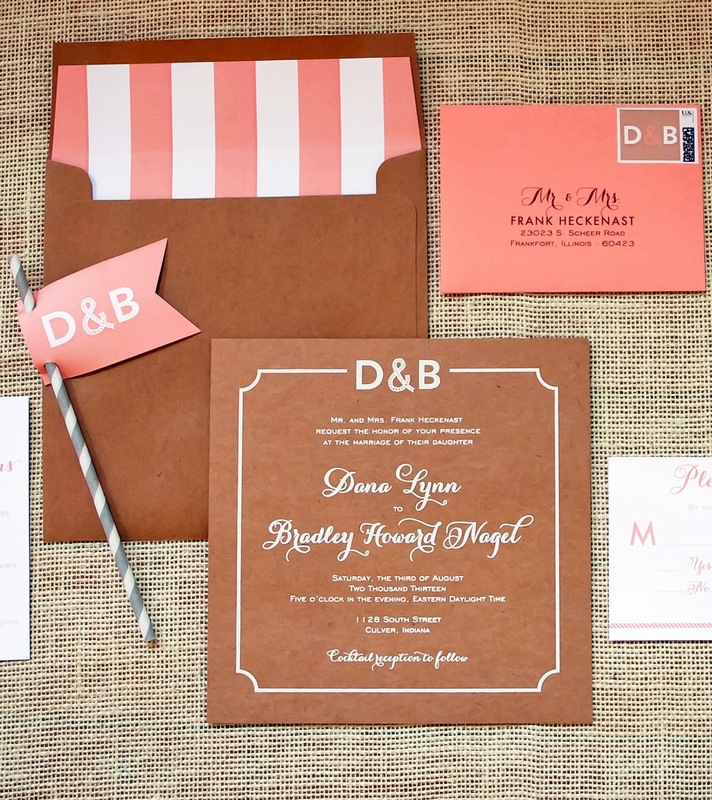 The striped envelope liner was the cherry on top, and we had calligraphy done in white to coordinate! 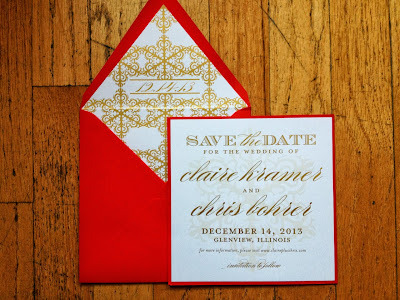 Claire and Chris are getting married two weeks before Christmas, so we wanted to get guests in the spirit of the season, while keeping their save the date both classic and fun! After deciding on the perfect "Christmas" red, gold foil stamping seemed like the perfect compliment. A subtle snowflake was first printed in lithography, with gold foil text printed on top. We then paired it with a colored envelope lined in a full pattern of the snowflake motif from the save the date! Topped off with beautiful gold calligraphy and a foil stamped return address, these are STUNNERS! Just wait for the invitations! Gold foil reception swag...pretty and proper and oh so fun! With more and more brides thinking out of the box, wedding invitations have become more than just your standard ivory stock with black engraving. Get creative! There are so many options out there, and foil stamping is just one more way to add some excitement to your ensemble! We at Nico and Lala believe in traditional elements paired with good design and showing some personality. A wedding invitation should reflect you and your groom, and what guests can expect at the ceremony and reception.....so have fun with it! Nico and Lala Custom Holiday Cards! 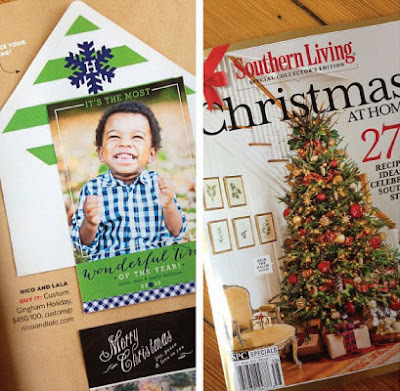 Here's a peek at our Christmas at Home feature--we couldn't be more excited! Isn't Parks the cutest thing you've ever seen?! Check out his family's previous years Christmas card below. While we may still be deciding on our Halloween costumes, the N&L studio has become holiday card heaven, with swanky new designs being created every day! In fact, we've not only started designing holiday cards...we've already shipped out holiday cheer to those really on top of their game! Here's a sneak peek at two designs that we've already shipped. At Nico and Lala, it pays to think ahead. Now through November 1st, receive 20% off the printing of your custom holiday card--now that's swanky! Still deciding on the perfect picture? No problem! Pay your design fee now, and get us your picture before November 15th to take advantage of this discount! Email us at custom@nicoandlala.com to get started!! 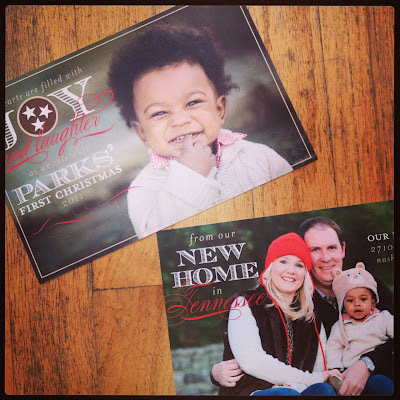 Check out a sweet sampling of custom holiday cards we've done in the past to get in the spirit of the season! 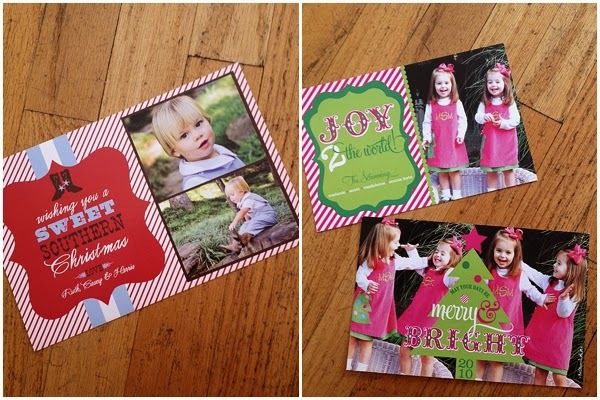 From more traditional red and green cards, to bright pink and green (with matching bows, of course) we do it all!! 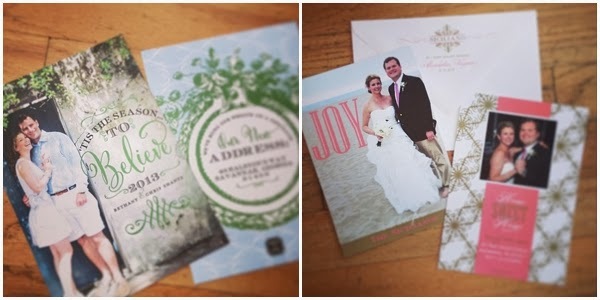 We love designing "Marry" Christmas cards for newlyweds too! 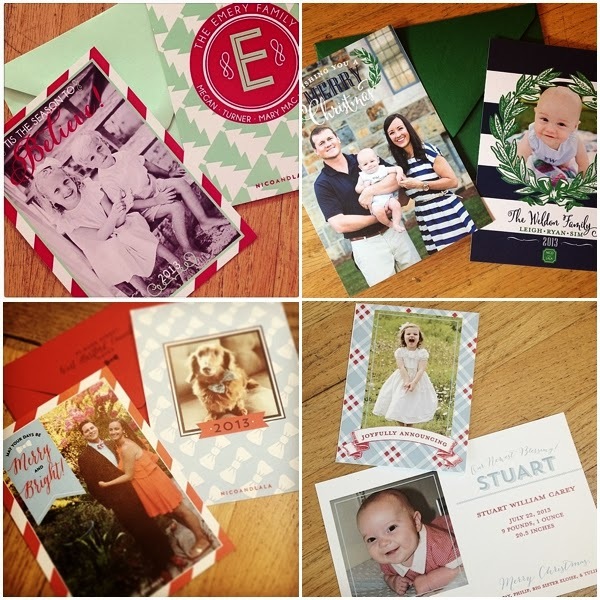 We are so excited to get started on your family's custom holiday card!! But remember, only two more weeks to take advantage of our holiday card special! custom holiday cards, custom Christmas cards, Southern Christmas cards, picture holiday cards, first married Christmas, Southern Living, Southern Living christmas cards, Southern Living holiday cards, Southern Living Christmas at Home, Southern Living favorite paper company, monogrammed Christmas card, Christmas card sale, holiday card sale, baby first christmas, baby's first Christmas holiday card.